Based in New Delhi, Goodwill Holidays is a well acclaimed travel company offering matchless Airline Ticketing Services to the clients. We, at Goodwill Holidays offer cheapest airfares to the clients and also provide complete information related to the departure and arrival of flights. Our dedicated team of executives is very cooperative with the clients. We provide both domestic and international ticket booking services at very affordable charges. 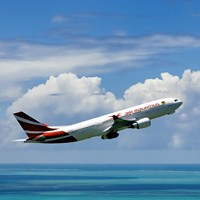 Plan your itinerary and we would give you pleasing and comfortable flight experience. We provide bookings for both group and individual bookings.